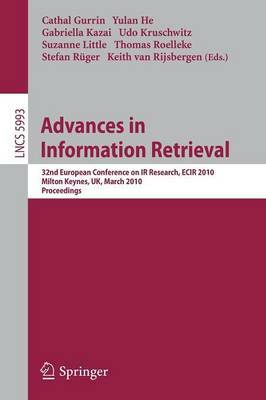 These proceedings contain the papers presented at ECIR 2010, the 32nd Eu- pean Conference on Information Retrieval. The conference was organizedby the Knowledge Media Institute (KMi), the Open University, in co-operation with Dublin City University and the University of Essex, and was supported by the Information Retrieval Specialist Group of the British Computer Society (BCS- IRSG) and the Special Interest Group on Information Retrieval (ACM SIGIR). It was held during March 28-31, 2010 in Milton Keynes, UK. ECIR 2010 received a total of 202 full-paper submissions from Continental Europe (40%), UK (14%), North and South America (15%), Asia and Australia (28%), Middle East and Africa (3%). All submitted papers were reviewed by at leastthreemembersoftheinternationalProgramCommittee.Outofthe202- pers 44 were selected asfull researchpapers. ECIR has alwaysbeen a conference with a strong student focus. To allow as much interaction between delegates as possible and to keep in the spirit of the conference we decided to run ECIR 2010 as a single-track event. As a result we decided to have two presentation formats for full papers. Some of them were presented orally, the others in poster format. The presentation format does not represent any di?erence in quality. Instead, the presentation format was decided after the full papers had been accepted at the Program Committee meeting held at the University of Essex. The views of the reviewers were then taken into consideration to select the most appropriate presentation format for each paper.